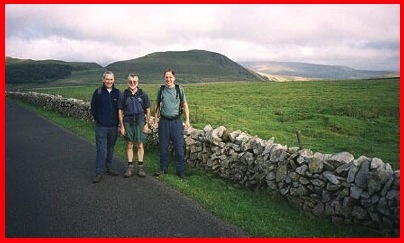 With a little bit of cajoling from Mick, Peter and Larry I decided to join them for the Hope Moors and Tors walk on Sunday 6th October 2002. A nice little Sunday stroll of 20 miles and 3700 feet of ascent. As it was an early start - Mick and Larry picked me up at 6 a.m.- I had to shorten the time I spent at my sister’s 60th Birthday Party the evening before. It was a surprise party and I didn’t wanted to miss seeing the look on her face as she walked into the function room of a local pub to be greeted by many friends and family. But back to the important part of the weekend. Larry, Mick and I met up with Peter just before 8 a.m. at Hope and by 8.10 p.m. we were on our way. 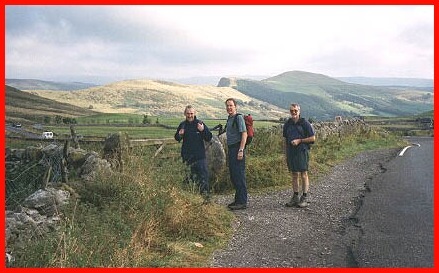 My previous walk notes on doing this "jaunt" in 2000 gives detail of the route so I won’t bore you with discussing this again but to concentrate on the main memories of the day and add a few of the pictures I took. 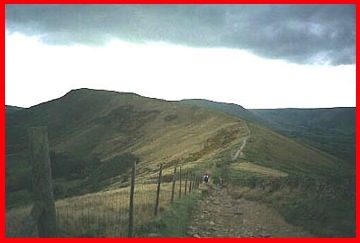 If you do want to read my report on the 2000 walk click here. 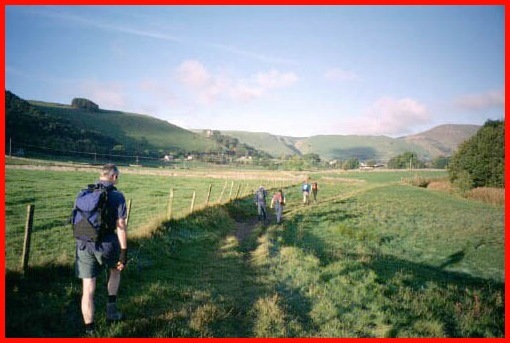 as we walk across the fields from Hope towards Castleton. Memory 1. 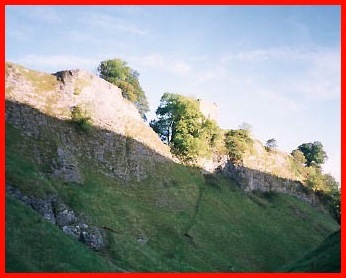 I forgot how steep Cave Dale is and needless to say I was last to reach the top. Memory 2. 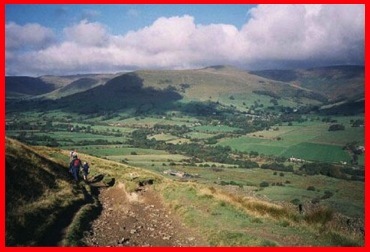 The enjoyment of the level walking from the top of Cave Dale to the A625 at the base of Mam Tor. This was probably the easiest part of the walk. Memory 3. 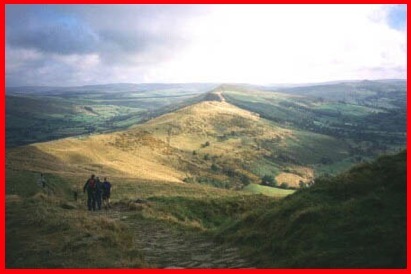 I love the steps up Mam Tor. Many may think they make the ascent too easy, but they made it easier on my ageing knees. Memory 4. 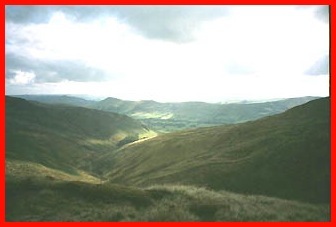 The view on the ridge down to Hollins Cross with Lose Hill beyond. Beautiful, but also worrying as you know you have to come back onto the ridge and climb Lose Hill later in the day. Memory 5. Following a chap with a "Where’s Wally" Hat on. Did he hear Larry as we were walking behind exclaiming; "I’ve found Wally"? 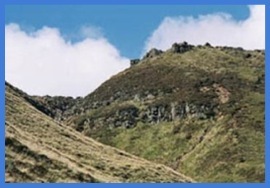 At this point it is also daunting when you look across the Edale Valley to Grindsbrook Clough and the climb on to Kinder and think "I’ve got to get up there". 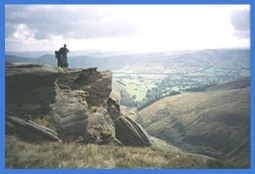 The poor female runner who we saw in Edale who had obviously "come a cropper" and damaged her face. I’m not sure if she had broken her nose or damaged her teeth or both but at the very minimum she was certainly going to be showing a few bruises on her face during the following days. Memory 8. 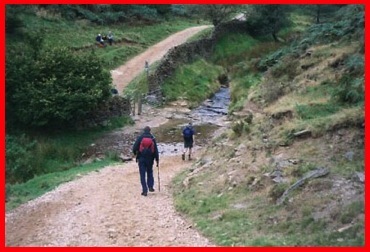 The grind up Grindsbrook Clough. Oh how I wish I had followed Mick’s lead and worn shorts. I thought it might be too cool for them. How wrong I was. It was a beautiful day and my trousers became really sweaty as I lagged behind my trio of friends as I slowly went up the "Clough". It’s a hell of a pull up, but it is really beautiful. Memory 9. 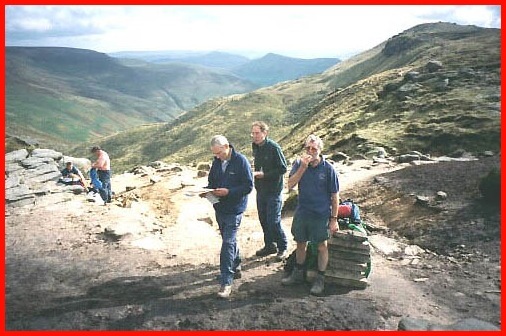 Refreshments at the top of Grindsbrook Clough. Memory 10. 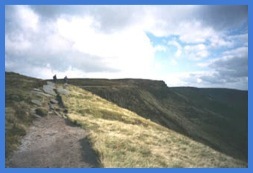 The walk along the edge of the Kinder Plateau. The views were great. It was a really clear day and it was so nice to see a number of parents had walked up with their young children and were picnicking on the top. Memory 11. Falling over on a path as we crossed Kinder. I’m obviously getting too old for these walks. I’m walking, but not very fast. I’ve got a pair of walking poles to give me improved stability. The terrain is pretty flat and I still miss my footing. Fortunately for me the Kinder peat is soft and all I hurt was my pride. Memory 12. 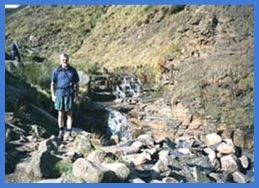 Zaggers Clough. It looks lovely from the top, interesting from the bottom but the pull out of it is a real pain. 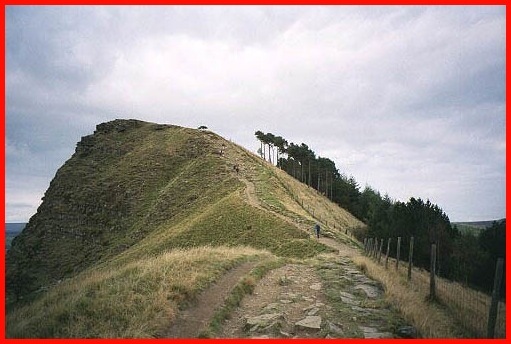 You’ve done Cave Dale, Mam Tor and Grindsbrook Clough and you know that you’ve still got Hollins Cross and Lose Hill to do but you tend to forget about this descent and ascent into and out of Zaggers Clough. Memory 13. A cup of tea at Rowland Cote – Check Point 7. Really really enjoyable. The biscuits were nice too. However, it was here when I realised I was unlikely to better my previous time for this walk. Memory 14. The climb up to Hollins Cross and Lose Hill and having to fight off over friendly sheep who wanted to lick my hand as I clicked my card to prove I’d visited these two check points. I think they would have also eaten my checkpoint card if I hadn’t taken care. Back Tor, we had to climb this before we reached Lose Hill. Memory 15. 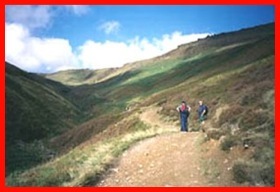 The walk down from Lose Hill to Hope. Having to read the instructions for the second time to make sure we got the correct path to get us back to the start/finish. The rest of the day Mick and I had relied on what we remembered from last time and my GPS. Memory 16. The relief on completing the walk. We were all given a time of 8 hours 22 minutes. However, on seeing the official event details on the Dark and White website - http://www.darkandwhite.co.uk/eventresults.html - it would seem that we all actually did it in 8 hours 12 minutes. I also found out that we were equal 46 out of a field of 78 walkers, although 4 did not officially finish as they missed a checkpoint or lost their "card". Memory 17. A wonderful pint of Mansfield Cask at a pub in Baslow. Memory 18. Having to change route from the M1 to the A38 as the MI was closed because ofa fire on the M1 near Leicester. We all got home at shortly after 8 o’clock. We had all agreed it was a great walk. Scenically probably the best we had ever done, but it was very very hard. I don’t think I will do it again, and I don’t think Larry will either. We both struggled at the end, but as for Peter and Mick who knows?PS. A big thank you must go to Peter, Larry and Mick who were kind enough to wait for me atthe top of the hard "pulls", and some of the easier ones also.